Zoom2! raises the bar to a new level of performance while delivering an average of eight shades, and sometimes as many as twelve, in less than an hour. Faster - Achieve superior results in three 15-minute sessions. The new system reduces chair-time by 33% with no compromise in results. 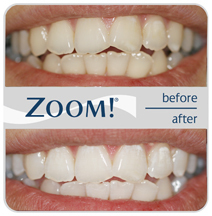 More Effective - The proprietary light activated Zoom2 gel incorporates patented Amorphous Calcium Phosphate1 (ACP) technology to provide superior whitening results. Easier - The new Precision Light Guide System ensures quick and consistent patient set-up for optimal whitening results, while the new locking casters and ergonomically designed structure make moving and positioning Zoom2 a snap. Lower Sensitivity - Reduced contact time, ACP chemistry, combined with the new Balancing Agent and Satin Finish, to ensure the lowest possible discomfort for patients. 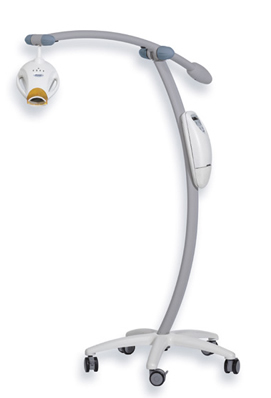 In fact, Zoom2 patients experience 67% less significant sensitivity than those treated with the original Zoom System. 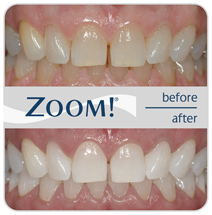 We are proud to offer the latest in chairside whitening technology, the ZOOM2! Advance Power whitening system. 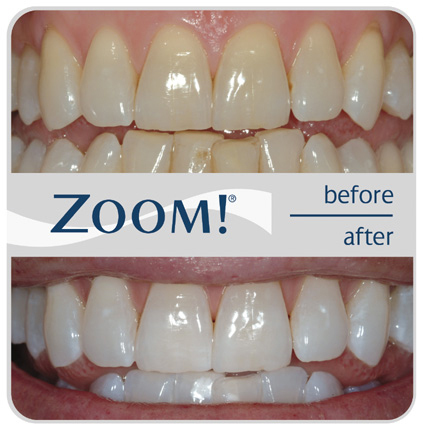 Call today to schedule an appointment to whiten your smile! Gift certificates for ZOOM are available and make a wonderful gift for weddings, graduations, birthdays or any special occasion.